Alright, Major League Baseball, you got to have all the fun. Now, it's our turn. Minor League Opening Day comes Thursday, when 120 teams from all four full-season levels begin their 2017 seasons. There will be new faces in new places, familiar faces in familiar places, prospects with something to prove and players getting their careers started. Team assignments are set. Everything's in place. All that's left is the pitching, the hitting, the fielding and the running. 10:30 a.m. ET -- It's relatively early in the day, more so for those on the West Coast. Though games won't start for another 3 1/2 hours, it's time to start checking things off your to-do list. Start by downloading Minor League Baseball First Pitch, available in Apple or Google app stores. It's a great way to find scores, news, schedules and video for all 160 Minor League teams, and if you turn on push notifications, you'll be the first to hear about news as it breaks about your favorite team or around the Minors in general. Once that's done, make sure you're ready to watch some of the biggest names in the Minors by subscribing to MiLB.TV. Games involving all 60 Triple-A and Double-A teams are on the service this summer with 26 clubs at the lower levels also streaming home games. Add in seven All-Star Games, select postseason contests and the Triple-A National Championship Game, and it's possible to watch more than 5,500 contests on MiLB.TV in 2017. Whether you're a Major League fan who wants to see what's coming or a wannabe scout from the couch, there's something for you on MiLB.TV every day through mid-September. 10:45 a.m. ET -- With technology taken care of, it's time for some pregame reading. If you're not familiar with Ben's Biz Blog, it's a good place to start. Written by MiLB.com's Ben Hill, the blog covers virtually everything related to Minor League Baseball outside of the games and players. Ben will embark on five Minor League road trips this season -- Frisco, Southern California, the Pioneer League, the Northeast and the Carolinas -- and by the time the season concludes, he will have visited 157 of the 159 ballparks in Minor League Baseball (sorry, Colorado clubs). And who knows? If Ben visits a ballpark near you, maybe you can serve as his Designated Eater. 11:30 a.m. ET -- Now turn to the players by diving into MiLB.com's Prospect Primer series. From that landing page, you can check out all 30 farm systems to find players expected to shine brightest, those prepared to break out and those getting ready for their first full seasons, among other things. It doesn't stop there. You can also check out Opening Week pieces on Top-100 prospects in the Majors and who we think is entering the 2017 season under the radar. 12:30 p.m. ET -- OK, you've filled your brain with lots of information. Now it's time to fill your stomach for lunch. That doesn't mean you have to be too far from baseball, however. Take the Minor League Baseball podcast with you. We've got a fresh episode prepared and plenty of other interviews from the offseason. While you're listening, be sure to subscribe in iTunes or Stitcher and leave a review to help spread the word to other potential Minor League fans. 2:05 p.m. ET -- The time is here! The Minor League season officially kicks off with a pair of International League tilts: the Scranton/Wilkes-Barre RailRiders vs. the Buffalo Bisons and an intrigue-filled match between the Rochester Red Wings and the Syracuse Chiefs. Why so intriguing, you ask? Because the Chiefs have made two guarantees. First, they've decreed the game-time temperature will be at least 53 degrees. Second, they've assured that the Chiefs will win the game. If either of these instances fail to occur, fans receive free tickets to an April or May game of their choice. To promote the Chiefs' guarantee, general manager Jason Smorol dressed up as Donald Trump and taunted his Rochester counterpart, Dan "Danimir Mutin" Mason. In Minor League Baseball, the hijinks begin immediately. 5:30 p.m. ET -- There's a four-hour break between those starts and the opening of the rest of the slate at 6:05 p.m. Unless those two IL contests go into extra innings, now's the time to start cooking hot dogs or doing whatever you need to do to get culinarily ready for a full night of baseball. 6:35 p.m. ET -- Minor League Baseball's most alliterative team debuts as the Class A Advanced Florida Fire Frogs host the Daytona Tortugas at Osceola County Stadium in Kissimmee, Florida. The Fire Frogs, representing the greater Orlando area, adopted their moniker after relocating from Viera, Florida, where they were the Brevard County Manatees. Osceola County Stadium served as the Houston Astros' Spring Training home through 2016 and last hosted Florida State League baseball in the form of the 2000 Kissimmee Cobras. 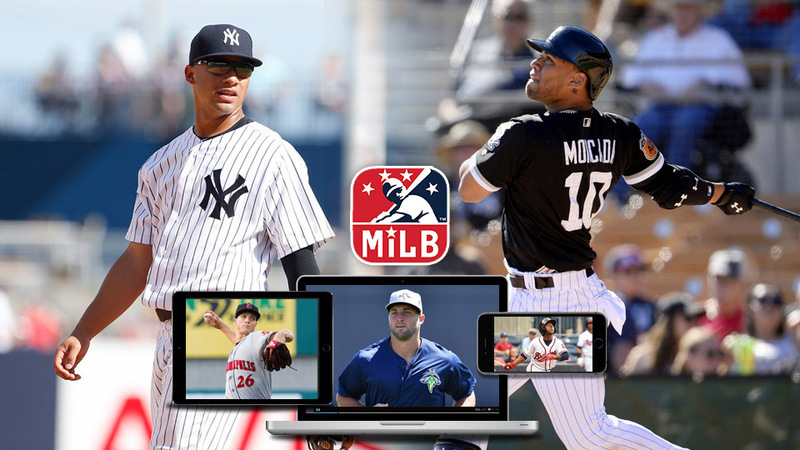 Yankees fans and prospectphiles will want to tune into MiLB.TV as No. 3 overall prospect Gleyber Torres makes his Double-A debut with the Trenton Thunder against Erie. Yankees general manager Brian Cashman said this offseason that the organization wanted Torres to "get baptized in the cold weather of the Eastern League," and he'll certainly accomplish that -- perhaps literally with game-time temperatures in northwest Pennsylvania dipping into the mid-30s and some snow in the forecast. 7 p.m. -- The Buies Creek Astros, one of two new additions to the Class A Advanced Carolina League this season, host the Winston-Salem Dash. The Astros, who are owned by the Houston Astros, are slated to play in Buies Creek for two seasons and then transition to a new ballpark in Fayetteville, approximately 37 miles south. In the meantime, they will share Jim Perry Field with Campbell University's Fighting Camels baseball team. 7:05 p.m. -- Five minutes later, the Carolina League's other new entrant takes the field for the first time. The Down East Wood Ducks, an affiliate of the Texas Rangers, open on the road against the Salem Red Sox. The Wood Ducks are based in Kinston, North Carolina, and will play at historic Grainger Stadium. That facility has a long history of hosting Minor League Baseball, most recently the 2011 Kinston Indians. If you're looking for more big-name prospects to stream, look no further than the Triple-A Charlotte Knights' matchup at home against the Norfolk Tides. That'll mark No. 2 overall prospect Yoan Moncada's first game in a White Sox affiliate's uniform, and given how BB&T Ballpark plays incredibly well for hitters, don't be surprised if it's a cracking debut for the 21-year-old switch-hitting infielder. The Knights also have one of the game's most prospect-laden rotations with Lucas Giolito, Reynaldo Lopez and Carson Fulmer, but even if they don't get the ball on Day 1, No. 7 White Sox prospect Zack Burdi could make a relief appearance. It could also be a wonderful return to Charlotte for top Orioles prospect Chance Sisco, who hit a grand slam during his Triple-A debut last September. Oh, and Tim Tebow makes his official Minor League debut as Class A Columbia hosts the Augusta GreenJackets. Mets fans, Florida football followers and the genuinely curious alike can watch the spectacle on MiLB.TV this night and every time the Fireflies are home this season. 8 p.m. ET -- Dr Pepper Ballpark, home of the Frisco RoughRiders, could be a chilly locale, but that will have no impact for fans spending the game in the team's much-lauded outfield Lazy River, which is now heated. The RoughRiders' "Opening Day Lazy River Pool Party" costs $39 per person and includes a team-logo towel and all-you-can-eat menu. Those who splurge on this extravagance can watch the action while floating on an inner tube within a pool big enough to fit 1.2 million baseballs. 10:05 p.m. ET -- On the West Coast, the night's just getting started. Triple-A Fresno hosts Reno and Sacramento takes on Tacoma in a pair of MiLB.TV games. The more interesting matchup might be in Tacoma, where Top-100 prospects Tyler O'Neill and Christian Arroyo make their Triple-A debuts. 1:30 a.m. ET (Friday) -- That should just about do it. You made it all the way through Minor League Opening Day. Time to hit the hay with the comfort of knowing that so much more of the national pastime is to come in the season ahead.